Now that we know who'll be playing in the College Football Playoff National Championship, let's get ready for an epic matchup between Oregon and Ohio State. The Rose and Sugar Bowls are in the books, but thanks to the College Football Playoff, the season isn’t over just yet. After months of predictions, Oregon and Ohio State will meet in the College Football Playoff National Championship on Jan. 12 in Arlington, Texas. The playoff is a new era for college football, so we’re all still figuring out what to think about it. But there are already plenty of things to look forward to. From uniforms to X’s and O’s, SI.com compiled 10 reasons to be excited for the Ducks’ upcoming matchup with Buckeyes. 1. There’s one more game! If the College Football Playoff is destroying the sport, someone needs to tell the fans. The overnight TV ratings for the Rose Bowl (15.5) and Sugar Bowl (15.3) both exceeded viewership of last year’s BCS title game. The semifinals simply captivated the country. But the best part is this? There’s still another fantastic game to play. Oregon taking on Ohio State will be must-see TV. Ohio State’s third-string quarterback has only two career starts, but as we know, that doesn’t tell the whole story. Jones led the Buckeyes to a 59-0 rout of Wisconsin in the Big Ten title game on Dec. 6. 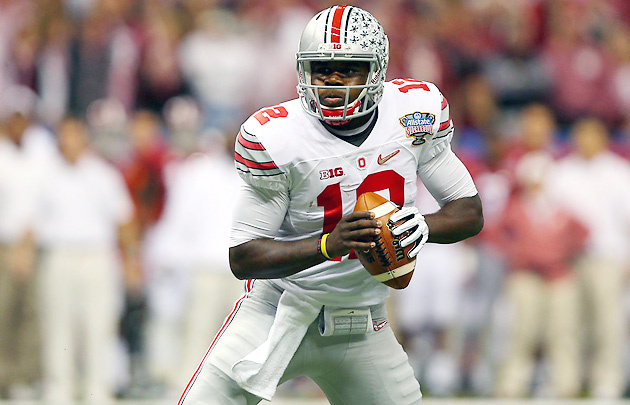 Then he took down mighty Alabama, 42-35, in Thursday’ Sugar Bowl to get the Buckeyes into the national title game. If the quarterback succeeds in his next game, his 3-0 record as a starter will include a conference title, a Sugar Bowl crown and a national championship. Could any quarterback have more on his résumé after three games? 3. Out with the old, in with the new? Oregon enters the national championship as a nine-point favorite. But based on history, the Ducks are a decided underdog. Ohio State has seven national titles, with the most recent coming in 2002 under former coach Jim Tressel. Oregon, meanwhile, has never won a national crown despite winning at least a share of the Pac-10/12 in four of the last six seasons. The Ducks are a new order in college football, but can they take down the historically dominant Buckeyes? 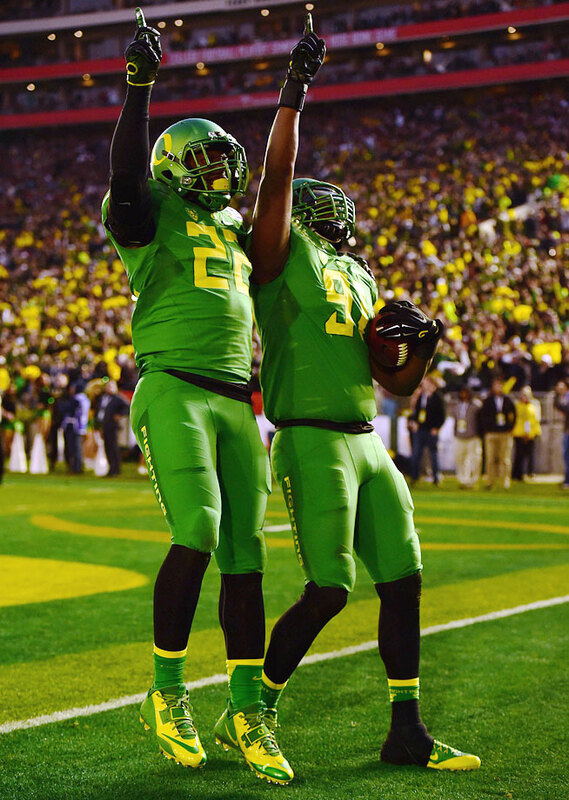 The Ducks whip out flashy uniforms for sleepy regular-season games, so you know they won’t disappoint against Ohio State. Oregon went with white helmets and white pants in the Pac-12 title game and then head-to-toe apple green in the Rose Bowl. What will Nike co-founder and Oregon power-booster Phil Knight have in store for the program’s appearance in Jerry World? 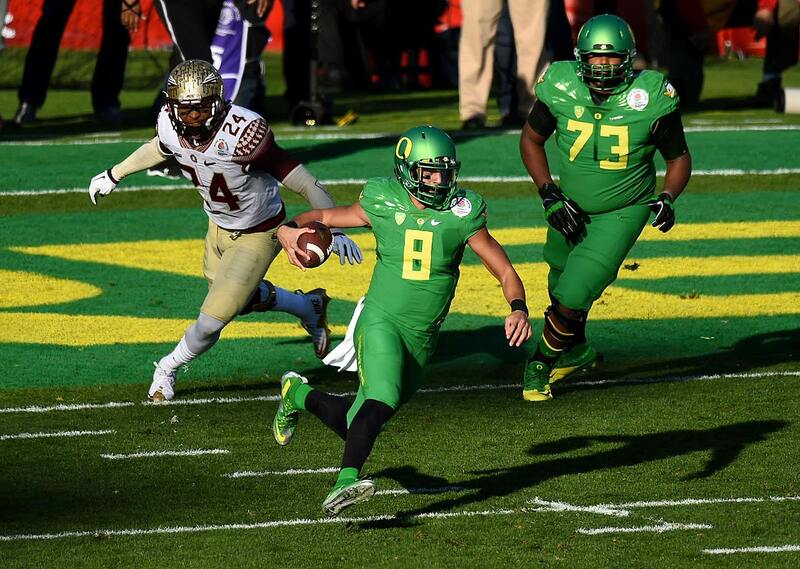 Marcus Mariota directed the Ducks' warp-speed, hurry-up offense, passing for 338 yards and two touchdowns. Although Jameis Winston threw for 348 yards, he committed three turnovers (one interception and two fumbles) in the game. 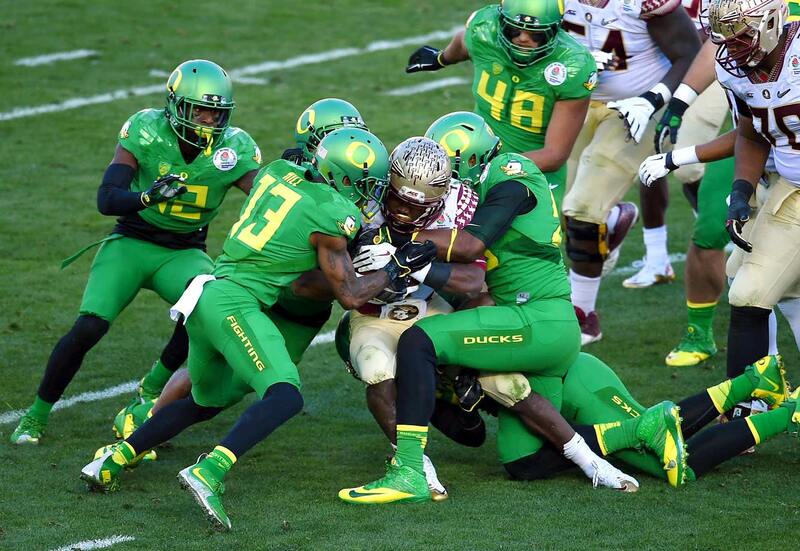 Thomas Tyner led the Ducks in rushing with 124 yards and two touchdowns. Karlos Williams scored on a 10-yard run late in the first half to close the gap 18-13. 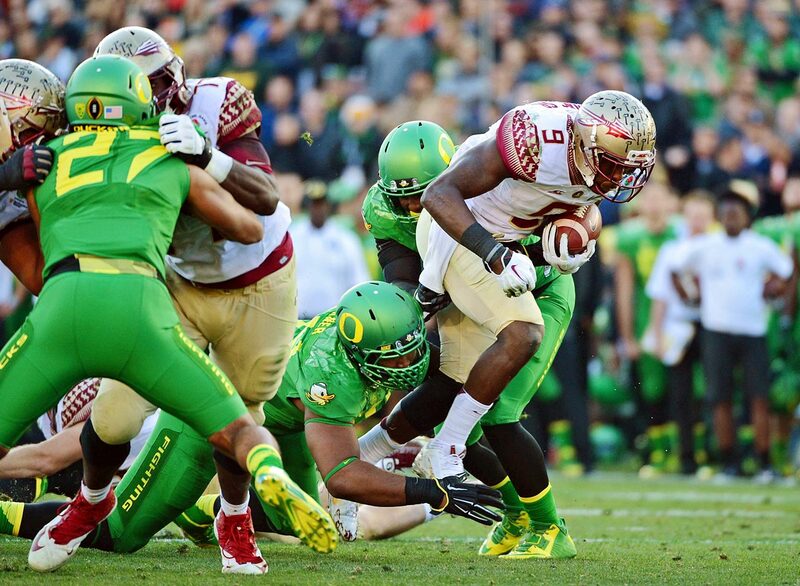 Dalvin Cook rushed for 103 yards, but the Oregon defense forced Florida State's freshman running back to fumble twice. 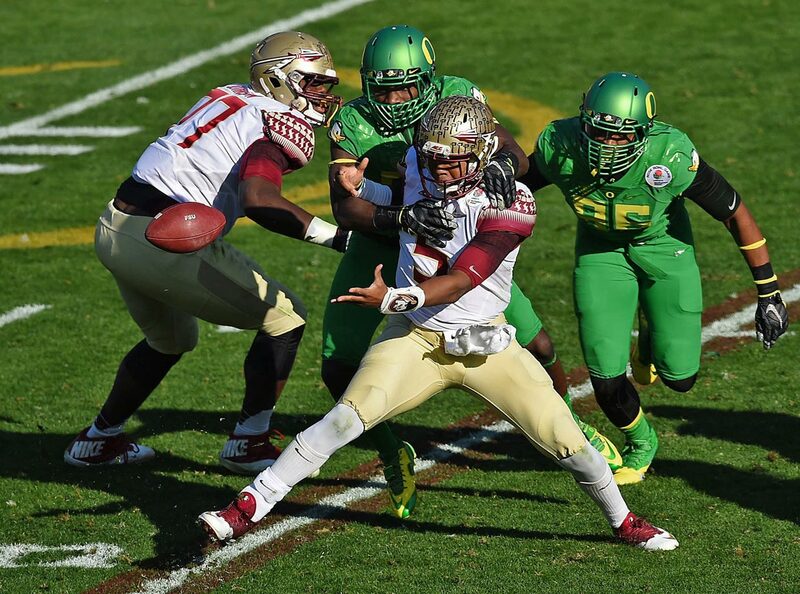 Jameis Winston fumbled four times, losing two to Oregon. 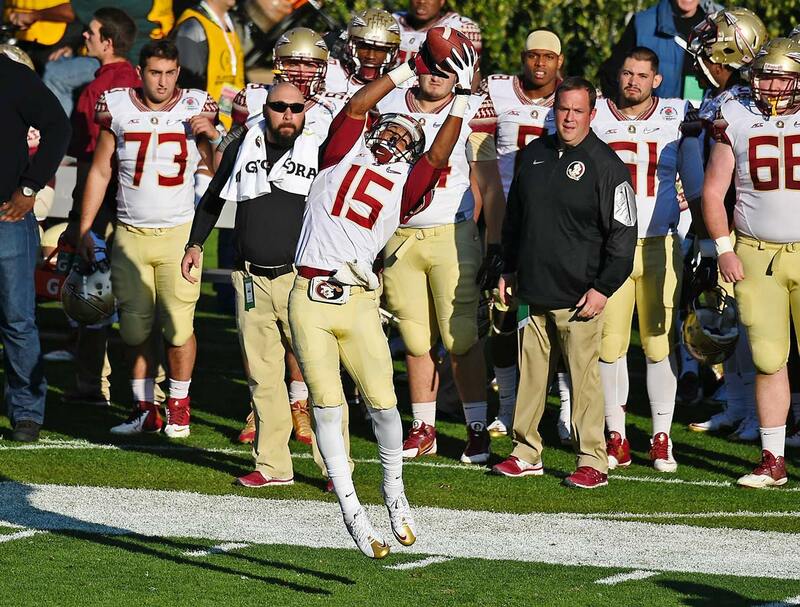 Freshman Travis Rudolph led the Seminoles in receiving with 96 yards, including an 18-yard touchdown pass to make it 25-20 Oregon with 8:07 left in the third. 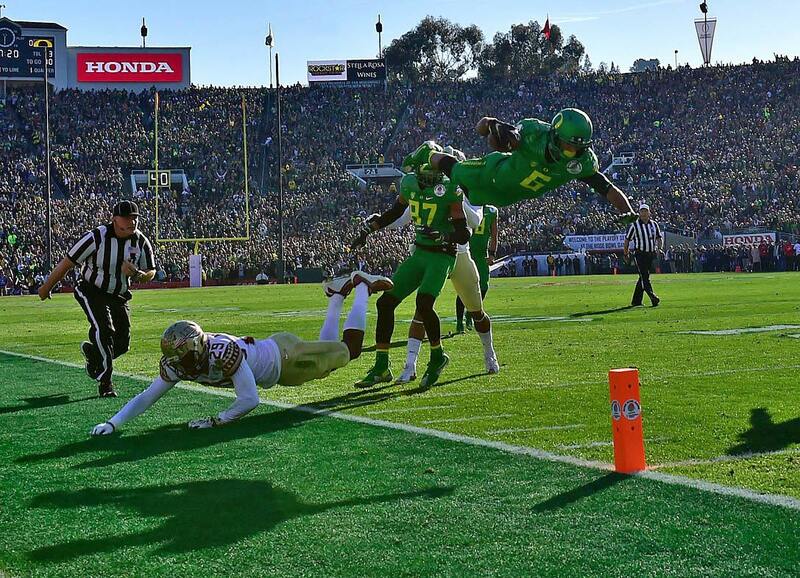 Darren Carrington led all wideouts with 165 yards and two touchdowns. Charles Nelson dives for the end zone but falls one yard short of a touchdown in the third quarter. 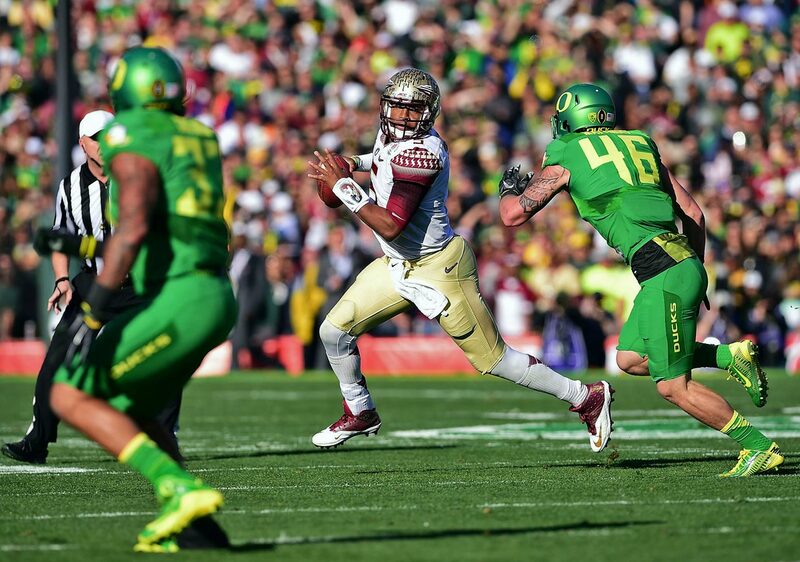 On fourth-and-5 in Oregon territory late in third quarter, Winston had lots of time but couldn't find a receiver. He was flushed from the pocket and as he loaded to throw his foot slipped and the ball popped out of his hands. Winston's fumble bounced into Tony Washington's arms and the defensive end went 58 yards for a score. 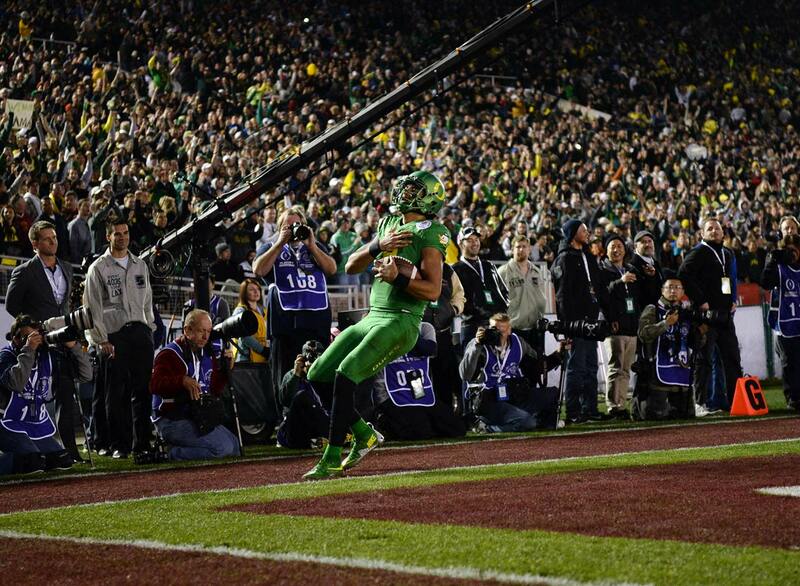 Washington celebrates his fumble return for a touchdown, which put Oregon up 45-20. When Mariota sprinted for a 23-yard touchdown with 13:56 left in the fourth quarter it made the score 52-20 and it made the Ducks the first team to reach 50 points in Rose Bowl history. Mariota and the Ducks are moving on, with a chance to add the biggest prize of all - the only significant one missing - to their trophy case. 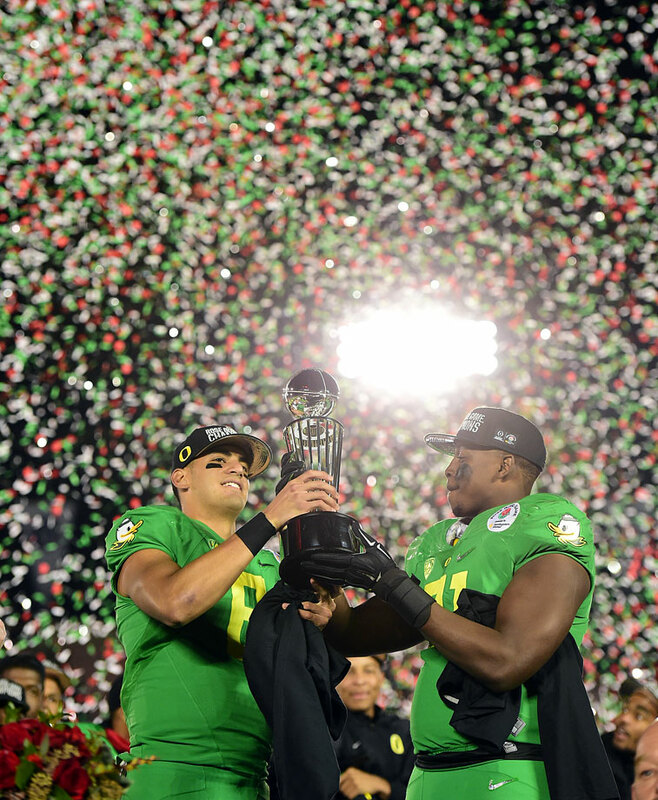 Marcus Mariota and Tony Washington hold the Leishman Trophy after Oregon's victory. The Buckeyes showed in the Sugar Bowl that they have plenty of power on the ground, compiling 281 rushing yards (6.7 average) against a Crimson Tide defense that allowed 89 rushing yards per game before Thursday. Oregon, meanwhile, reeled off 301 rushing yards and five touchdowns against Florida State behind Marcus Mariota, Thomas Tyner and Royce Freeman. But how will the Ducks handle Joey Bosa and Ohio State’s defensive front? He’s a Heisman Trophy winner. He’s from Hawaii. 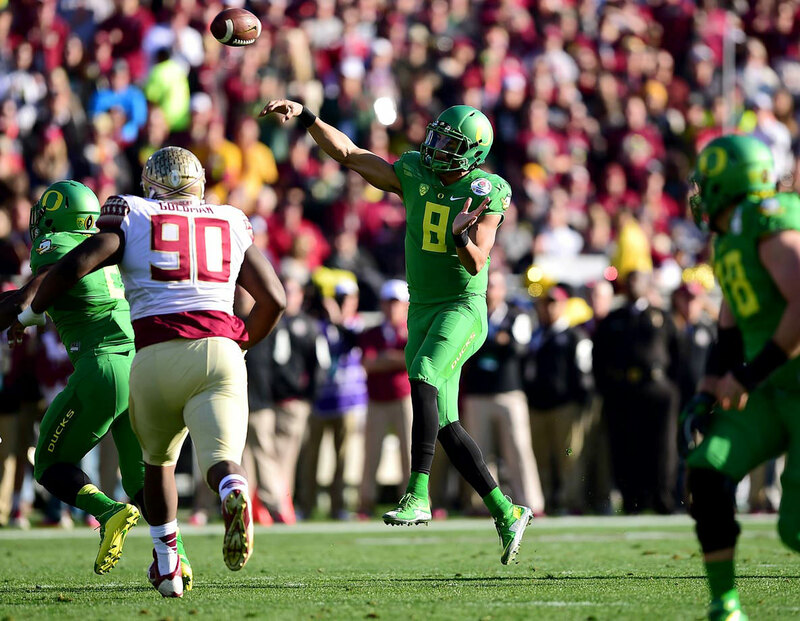 We know plenty about Mariota by now, but that doesn’t mean he’s any less fun to watch. 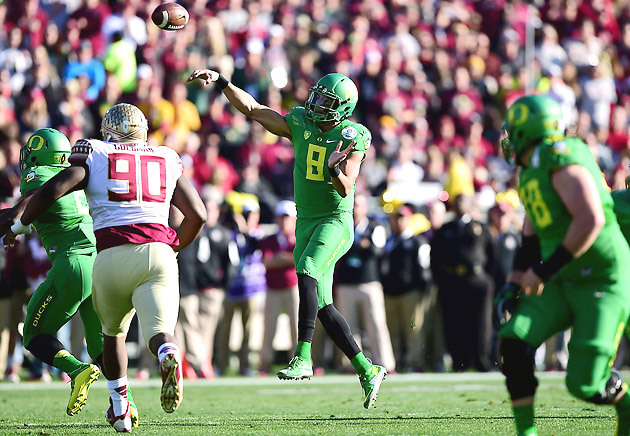 The Ducks quarterback showed up big in the Rose Bowl, racking up 400 yards of offense and three touchdowns against the Seminoles. He’s thrown just three interceptions all season, but he’ll go up against an Ohio State defense that forced Alabama quarterback Blake Sims into three picks Thursday. 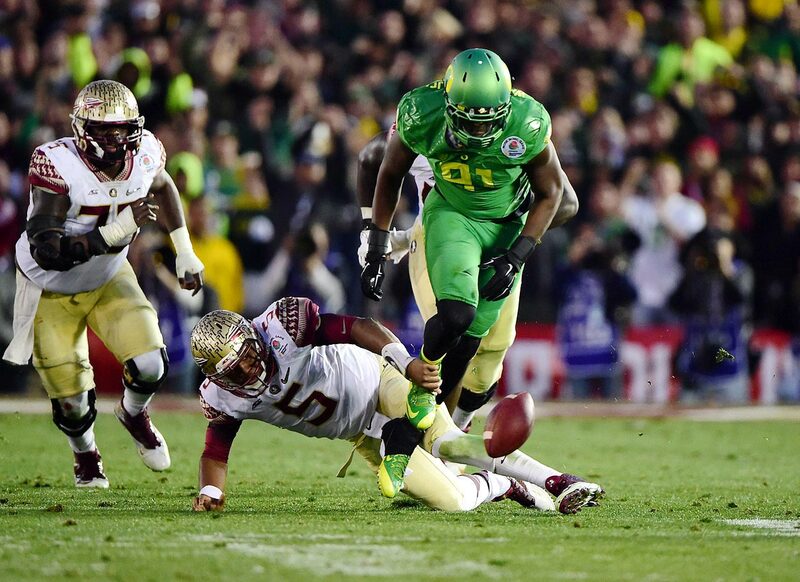 Oregon will need a near-perfect performance from Mariota to take the title. Ohio State coach Urban Meyer learned of Oregon’s 59-20 destruction of Florida State during his postgame Sugar Bowl press conference. “Oregon won by 40?” the coach said, laughing. “I’ve got to go. We’ve got to go get ready.” Meyer may have two BCS titles to his name -- both at Florida -- but Ducks coach Mark Helfrich should have his full attention. Helfrich, who somehow remains one of the Pac-12’s lowest-paid coaches, must now face another spread guru in Meyer. Who won’t enjoy watching those two offensive-minded coaches strike blow after blow on Jan. 12? 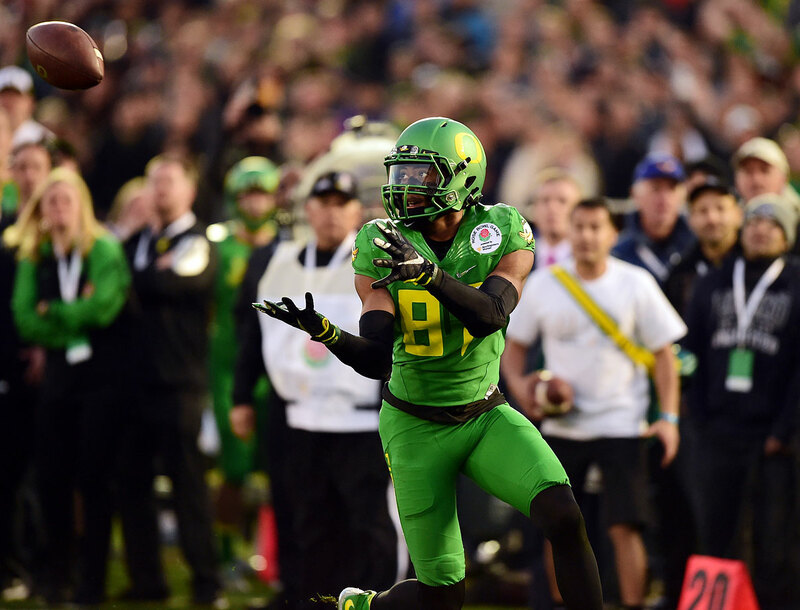 The Ducks’ passing defense gives up 265.9 yards per game through the air, 111th nationally. 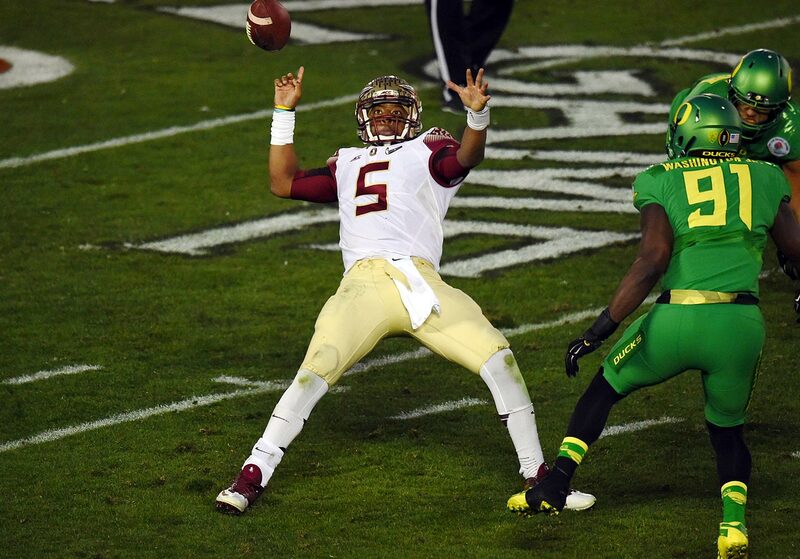 Even in Thursday’s loss in the Rose Bowl, Jameis Winston completed 29 passes for 348 yards. Oregon’s secondary should hone in on one target on Ohio State’s offense: receiver Devin Smith. During the last four years, Ohio State is 22-0 when Smith catches a touchdown pass. (He caught a 47-yard scoring toss against Alabama.) The Ducks still won’t have injured All-America cornerback Ifo Ekpre-Olomu for the title game, so they’ll have to find a way to limit Smith in the open field. Ohio State's defensive front boasts an embarrassment of riches, and defensive end Joey Bosa, the program’s first unanimous All-America selection since linebacker James Laurinaitis in 2007, is just the tip of the iceberg. Tackle Michael Bennett tallied a sack and 1.5 tackles for loss against Alabama. Linebacker Darren Lee had three tackles for loss and two sacks. Can Oregon’s offensive line, which has struggled with injuries this year, protect Mariota from the Buckeyes' defensive talent? An SEC team has won or played in a national title game in every season since 2005. That’s why fans in the South are frantically forming support groups following Alabama’s loss to Ohio State. This year, a team from the Big Ten or Pac-12 will raise the hardware, adding insult to the SEC’s dismal postseason performance injury. Does this mean the SEC’s reign of supremacy is over? Not yet, but it does mean fantastic radio on the horizon from Paul Finebaum Show callers.